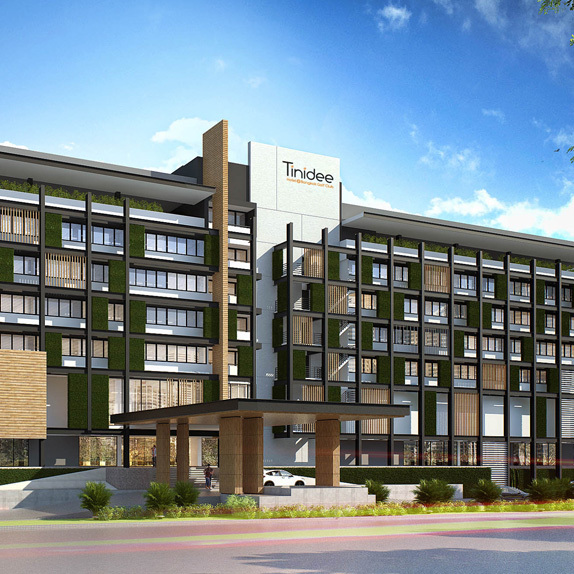 “Tinidee Hotel@Bangkok Golf Club” is a stylish resort dedicated to offering the perfect getaway for business and leisure, situated between two superb championship golf courses and has top class, modern health and fitness facilities to compare with the best. State-of-the-art business and function facilities, with proficient, professional technical and organizational support, make the resort an ideal location for meetings, seminars, conferences and social functions. The resort is just 45 minutes from downtown Bangkok, 50 minutes from Suvarnabhumi International Airport, and 25 minutes from Don Muang International Airport. Elegantly appointed, the stunning décor is a fusion of modernity meets local touch, enviably surrounded by natural beauty with less traffic, pollution and noise, more peace and quiet. We offer excellent value for money, because we do not have big city costs, so can offer top quality and city-comparable facilities at local rates. Tinidee Hotel@Bangkok Golf Club is operated by the dynamic and professional management company, MBK Hotel and Tourism (MBKHT), a member of MBK Group. “Tinidee", in Thai, translates as “A Good Place”, and we believe that’s what you will find here. Warm-hearted, well-balanced, well-appointed, a place that will fulfill all your expectations. 9th Floor, 444 MBK Tower, Payathai Road, Wang Mai, Pathumwan Bangkok 10330.